Cincinnati’s own denizens of art-pop, The Pomegranates, introduced their stellar sophomore album to a packed house at the Southgate House in Newport, KY on March 13th for their CD release show. They were supported by opening acts Enlou and Michael Shelton and the Polyvinyl Records’ touring machine known as Headlights (who played “Tokyo” much to my delight). The Pomegranates played their new album, “Everybody Come Outside!” from beginning to end before an encore that featured favorites from their previous releases. The perfect song to open an album and show is the title track, “Everybody Come Outside!”. The pounding drums and Joey’s megaphone enhanced Carnival-bark grabbed the audience’s attention and never let go. Dressed in matching brown jumpsuits with “The Future Calls” painted on the back and war paint on their faces, The Poms pulled out all the stops for their hometown crowd. Following in order, and playing some songs live for the first time, “Beachcomber” was next with its shifty arrangement, shimmering guitars and sweet vocals. The fake-out ending that trails off into a few seconds of silence, was just enough for the crowd to erupt in applause, before the actual cacophonous ending. The poppy bounce of “This Land Used To Be My Land, But Now I Hate This Land” immediately began with a chiming guitar line and a clever vocal trade off and ended as Joey channeled the band Me Without You with a frenzied rant. The highlight of the night was when the members of fellow Cincinnatians and opening band, Enlou joined The Poms on stage to play percussion, dance and sing back-up vocals on the infectiously catchy, “The Southern Ocean.” The next song on the album was the only one that was not played; the short acoustic “Sail (Away With Me)” which was replaced in the set by the song “Sleepover”. Next was the spacey lead single, “Coriander” which opens with cascading guitar noodling over a fuzzy bass line and bleeds into the short, dreamy track “384 BC”. Handclaps and sunny guitar lines propelled “Svaatsi Uutsi”, as Josh took the vocal reigns, asking “Do you wanna go for a ride?” Their Modest Mouse influence shines through the most in the vocals, the reversed guitar and drum tracks, and frenetic dance passage of “Jerusalem Has a Bad Day” without becoming a distraction. The twinkling guitars, easy going vocals and steady keyboards on “Tesseract” are reminiscent of Voxtrot. Album closer, “I Feel Like I’m a Million Years Old” might feel like it is a million years long but clocks in at thirteen minutes. Based on a slow acoustic guitar riff and enhanced by trance-inducing hypnotic keyboards and samples, the song is over before you know it. As this was the last song on the album, it was also the last song for their set. They left the loop playing and their guitars in their stands as they left the stage. For the encore, they played to the crowd and offered up “Thunder Meadow”, “The Bellhop” and “In The Kitchen” from last year’s “Everything Is Alive” album and closed with “Osidius The Emphatic” from their debut “Two Eyes” EP. 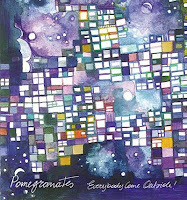 With their tight and energetic live show and the stunning song-writing chops on new album, “Everybody Come Outside!”, The Pomegranates prove they no longer need to be compared to contemporaries such as Modest Mouse and Wolf Parade but that they belong right there on the list with them.